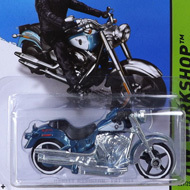 206/250 is part of the HW Workshop series and the 2014 Super Treasure Hunt set. The Spectraflame red wagon sports “Speedhunters” and a white circle with a “0” on the sides and hood. The sides also have white stripes, “TH”, Japanese text, the Hot Wheels logo, and other logos. It has a black interior, clear windows, 8-spoke Real Rider wheels with black spokes and chrome rim, and a black plastic Malaysia base. 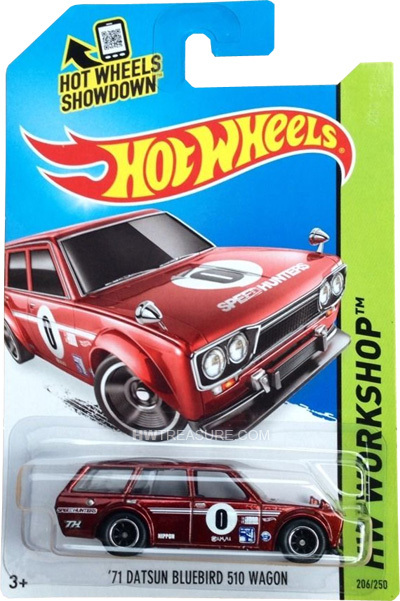 The Datsun 510 made its debut in the 2013 Hot Wheels Boulevard series. The T-Hunt gets its likeness from the vehicles that are still used in Sports Car Club of America racing events.